In addition to teaching in the Sociology and Latin American and Latino Studies Departments, Walter "Wally" Goldfrank also co-founded Merrill College (pictured). Professor Goldfrank graduated from Harvard University and earned a certificate in sociology from the University of Madrid and a Ph.D. from Columbia University. During graduate school he worked part time at the NAACP Legal Defense and Educational Fund and later participated in the civil rights and antiwar movements. 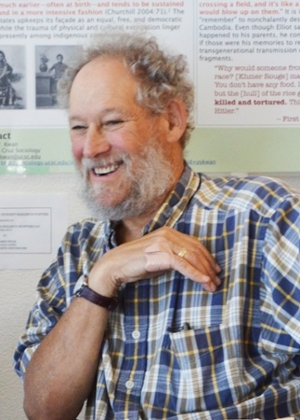 Goldfrank joined the UCSC Sociology faculty in 1968. He was a founding fellow of Merrill College in 1971, and also helped found the Latin American and Latino Studies (LALS) Program (1997) which later became the Latin American and Latino Studies Department (2000). He also was instrumental in the creation of LALS's Ph.D. program (2014)—the first of its kind in the world. He was crucial in shaping the Sociology Department's graduate program, serving significant terms as both graduate director and department chair. He also served as the provost of Rachel Carson College (formerly College Eight) from 1988 to 1996. Along with birding and travel, teaching was Goldfrank's lifelong passion and throughout his career hundreds of students passed through his courses on world society, sociological theory, development and underdevelopment, revolution, and the sociology of sports. 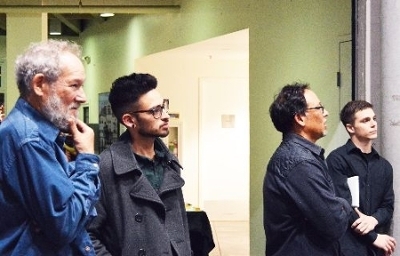 Walter "Wally" Goldfrank (left) with sociology student Edward Ramirez and sociology professor Steve McKay at an event at the Santa Cruz Museum and History, 2015. Goldfrank also mentored many doctoral students over the years, signing off on his last dissertation just a few weeks before his death. Goldfrank's commitment to justice and peace that comprised his life's work has had a lasting impact. For more information about Wally Goldfrank and his extraordinary legacy, please also see his obituary in the Santa Cruz Sentinel. The Wally Goldfrank Student Award was established to honor Goldfrank's legacy. The fund will provide support to undergraduates and graduate students in the Latin American and Latino Studies Department.